The IFTA Awards are only five days away (Sunday May 24) and we continue our coverage of the ceremony with a look at the very talented Best Supporting Actor Film category. The nominees this year are Domhnall Gleeson for musical dramedy ‘Frank’, Allen Leech for the Oscar-nominated Alan Turing biopic ‘The Imitation Game’, James Nesbitt for Irish comedy-drama ‘Gold’ and Andrew Scott for LGBT rights drama ‘Pride’. 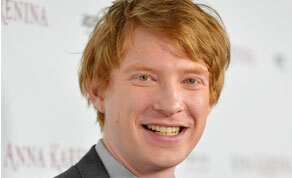 Celebrating his fifth IFTA nomination this year is Domhnall Gleeson. In Lenny Abrahamson’s acclaimed film ‘Frank’ – Gleeson plays a wannabe musician who fortuitously gets invited to join a band led by the enigmatic Frank. The film and Gleeson’s performance has received acclaim with Variety saying: “in Gleeson’s gifted comedic hands, Jon embodies a shy, self-effacing British stereotype altogether unsuited for rock-star status,” and The Irish Times praising Gleeson’s chemistry with co-star Michael Fassbender (who is nominated in the Best Actor category for his role in the film). Gleeson was nominated last year also for ‘About Time’ and has won two IFTA Awards in the past – for ‘Anna Karenina’ and ‘When Harvey Met Bob’. He has also been receiving acclaim as of late for his role in Alex Garland’s sci-fi film ‘Ex Machina’ and upcoming films include John Crowley’s ‘Brooklyn’, Alejandro González Iñárritu’s ‘The Revenant’ and ‘Star Wars 7: The Force Awakens. Also celebrating his fifth nomination this year is Allen Leech. Nominated for his role in the widely praised Oscar-nominated film ‘The Imitation Game’, Leech has previously been nominated for projects such as ‘Cowboys & Angels’, ‘Love is the Drug’, ‘Legend’ and ‘Downton Abbey’. ‘The Imitation Game’ tells the story of cryptanalyst Alan Turing and the challenges he faced for his innovative methods during World War 2, as well as his more personal struggle to hide his homosexuality. The performance of the cast has received acclaim and have so far received nominations from the San Diego Film Critics Society Awards, the Broadcast Film Critics Association Awards and the Screen Actors Guild Awards. Leech can next be seen in the thriller film ‘Hunter’s Prayer’ opposite Sam Worthington and directed by Jonathan Mostow. Also nominated this year is Northern Irish actor James Nesbitt. Nesbitt has previously been IFTA-nominated for ‘Bloody Sunday’ and ‘Wall of Silence’. He has also received three IFTA nominations for British crime-procedural series ‘Murphy’s Law’, winning the award in 2003. Nesbitt has also been praised as of late for his performance in the British mystery drama series ‘The Missing’, which secured him a BAFTA Award nomination earlier this year. He has has recently been seen in the Hobbit Trilogy. Rounding out the list is Andrew Scott (who is also nominated in Best Supporting Actor Drama category for his role in ‘Sherlock’). Scott has already won a British Independent Film Award (BIFA) for his performance as Gethin in British LGBT rights drama ‘Pride’, getting honoured ahead of an acclaimed cast which included Bill Nighy and Paddy Considine. Scott has previously won two IFTA Awards – for British television series ‘Sherlock’ in 2013 and Irish film ‘Dead Bodies’ in 2004. He also garnered a nomination last year for his lead role in John Butler’s comedy ‘The Stag’. Scott has been a busy man as of late, getting cast in the new James Bond film ‘Spectre’ - which will be released later this year – as well as nabbing a role in ‘Victor Frankenstein’ opposite James McAvoy and Daniel Radcliffe. He will also be seen next year in ‘Alice Through The Looking Glass’ alongside Johnny Depp, Anne Hathaway and Helena Bonham Carter. The IFTA Film & Drama Awards takes place on Sunday, May 24 with TV3 airing a one hour special on the ceremony on Monday, June 1st.